Musical Mystery Tour albums - the complete set. 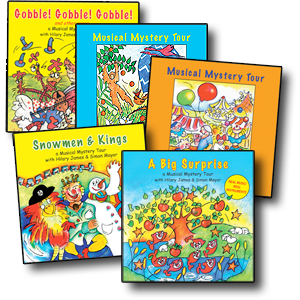 All five albums in the Musical Mystery Tour series - at a special price! By train, tractor, bicycle or even hot-air balloon - the Musical Mystery Tour introduces you to a lively collection of characters and places. Discover snowmen and kings, parrots and flamingoes, sleepy sheep and weeping willows - and even a donkey who can't-can't do the can-can!